You are what you eat, and this is equally true for the cats that depend on us for "room and board." Indeed, cat food is one of the most important expenses of feline guardianship, next to veterinary care. It is important also to note that proper diet can eliminate or delay veterinary expense for some serious medical conditions. The ultimate purpose of this series is to help you learn how to read cat food labels to make your decision process easier in choosing the best foods for your cat, but first, we need to cover some of the basics. Cats do not need carbohydrates, although corn, wheat, and rice are used as fillers for both canned and dry cat foods. Other ingredients, such as binders, flavoring, and coloring, are added by cat food manufacturers to satisfy the aesthetic wants of the consumer. Although preservatives are necessary, to keep foods fresh for our cats, canned food should not be allowed to remain out for any length of time, in any case. While dry food is convenient and can be left out for "free feeding,"
To ensure that your cat gets the right amount of nutrients. That "near-perfect" food you've selected might be adding too little (or too much) of certain minerals and vitamins. Cats may become bored with the same food day in and day out, and simply quit eating. Face it, would you enjoy pizza morning, noon, and night, for years? You not only would become bored with your diet, but your health would suffer too. To head off possible allergies to certain ingredients. Cats (like humans) develop allergies over a period of time. Although the incidence of food allergies in cats is rare, cat owners might want to err on the side of caution, particularly if their cats have shown evidence of allergies in the past. To prevent "food addictions." The Whole Cat Journal, in its October 2001 issue, cites the case of a cat that was addicted to a particular flavor of a particular brand of cat food, right down to a specific factory and lot number! This kind of addiction can be difficult to deal with when that last can is gone but can be easily avoided by feeding a variety of foods from the start. 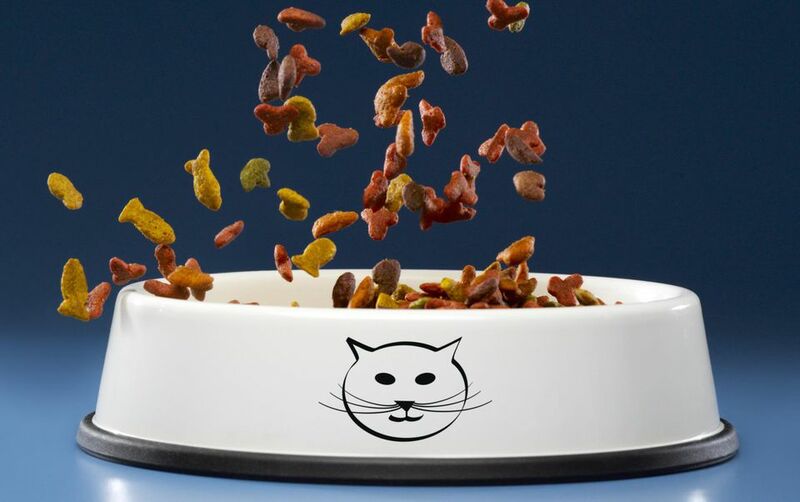 This doesn't mean that Fred should get a different food every day, but a variety of high-quality canned foods, supplemented with dry food for cats left alone all day, will add spice to his diet and keep him from becoming "Finicky Fred." Many first-time cat owners, in an attempt to hold down expenses, buy the cheapest foods they can find for their cats. This is a false economy for a couple of reasons. First, studies have shown that cats eat as much as they need to get the nutrients they require. Therefore, they might eat twice as much of that generously-carbohydrate-filled store brand to get the nutrients they need in a normal feeding of premium food. Second, the continued feeding of substandard foods over a period of years will heavily contribute to, or even cause, serious medical conditions that will require expensive veterinary care. Compliance with AAFCO's requirements for "Complete and Balanced," as evidenced by that wording on the label. Named protein source - look for "chicken, turkey, lamb, or beef," rather than "meat." Words such as "By-products," "meat and bone meal," "animal digest," most other descriptions including "digest" or added sugars. Cats are obligate carnivores, and cannot thrive on vegetarian diets, although most vegetables can be added to cats' diets, either by the manufacturer or the consumer. Preservatives, at the level included in commercial pet foods, have never been scientifically demonstrated to cause any problems in pets (or people) at less than 100 times the levels found in such foods. On the other hand, the current policy for many cat food manufacturers is toward using natural preservatives, such as vitamins C and E.
The AAFCO (American Association of Feed Control Officials) is an advisory body that proposes regulations for the production and labeling of animal feeds, including pet food. Its membership consists of regulatory officials from many states' feed control bodies, Federal agencies (FDA), and like agencies in Canada and Costa Rica, as well as members of other interested groups, such as the Animal Protection Institute, and various veterinarian colleges. The AAFCO includes a Pet Food Committee, chaired by Ms. Liz Higgins. Defines terms for labeling, e.g., "meat by-products." Defines quantity determination for label titles, e.g., "Chicken Cat Food," "Chicken Dinner for Cats," "Chicken-flavored Cat Food."